Way back in middle school, I remember that my art teacher considered me one of the best artists in her class. It was an honor to have that title and I took pride in the fact that I cared so much about art and that my teacher acknowledged it. 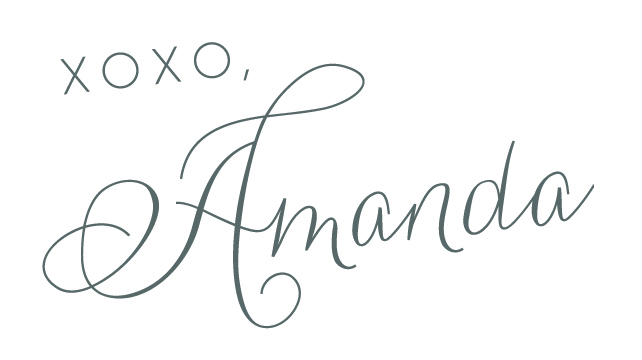 Since then, I’ve turned to digital art (click here to view my Etsy shop) and haven’t taken to pen/paper, canvas/paintbrush for quite some time – so I’m very “rusty” to say the least! 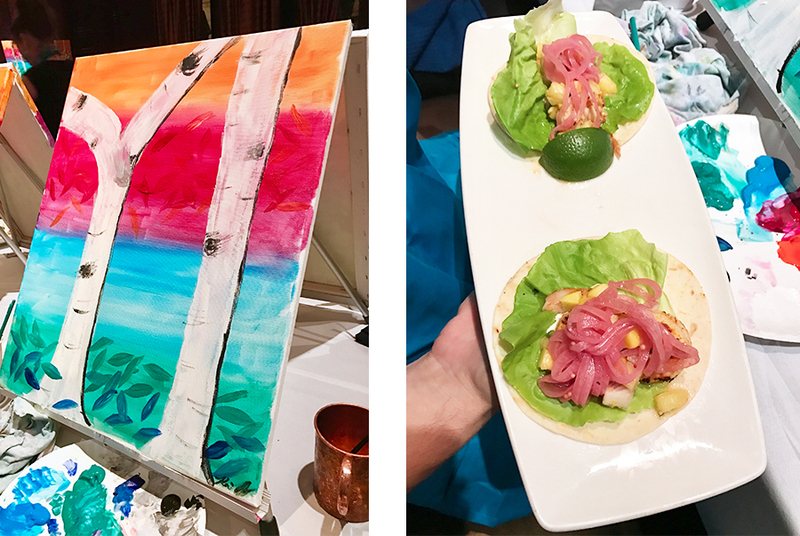 However, when a representative for Devon Seafood + Steak contacted me about participating in a Sip & Paint event, I was happy to oblige! 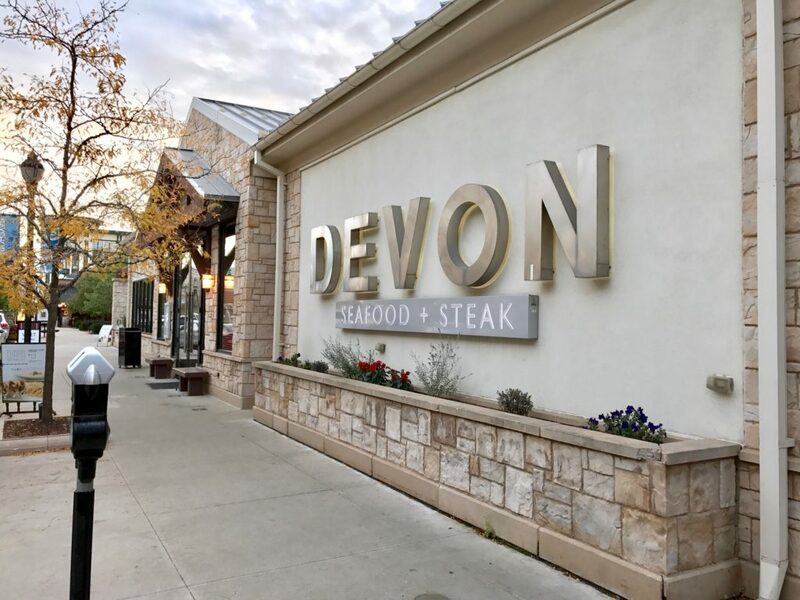 This past Monday, my husband and I took the 45 min trek to Bayshore Towne Center to visit Devon Seafood + Steak for the first time. 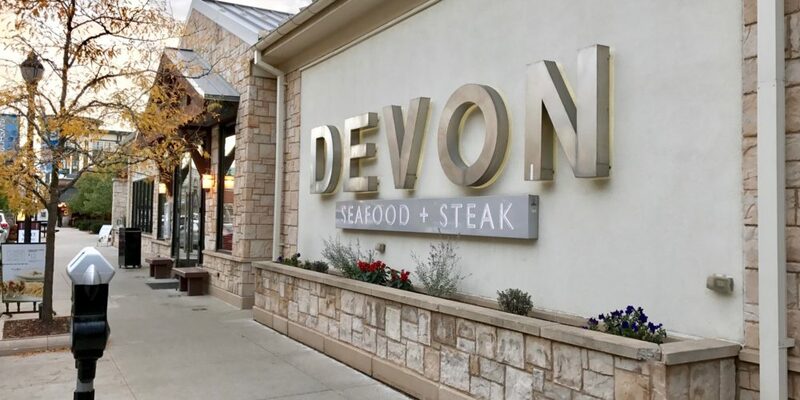 I’ve been to Bayshore multiple times but never had the pleasure of dining at Devon. The restaurant’s exterior is beautiful! Gorgeous light stone and a modern gold and silver metal sign. The interior of Devon also didn’t disappoint. 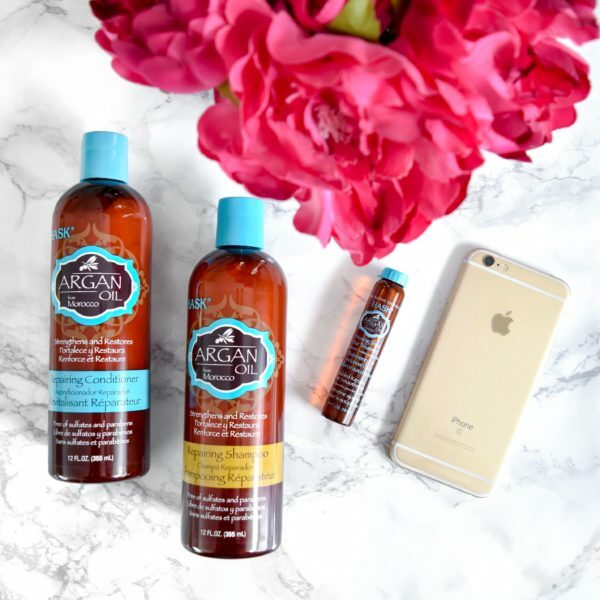 The atmosphere is warm and relaxing with a contemporary twist – great for a night out with friends and/or family! Our event was held in the private dining room. Although I didn’t count, I’d have to say there were at least 25+ people at the event. The artist/instructor, Gina from Color on Canvas, was wonderful! She provided very clear instructions and demonstrated each step on her own canvas which was so helpful! She mentioned she donates a percentage of the proceeds to the Ronald McDonald house, who helped her family when their daughter was in the hospital being treated for Turner Syndrome. 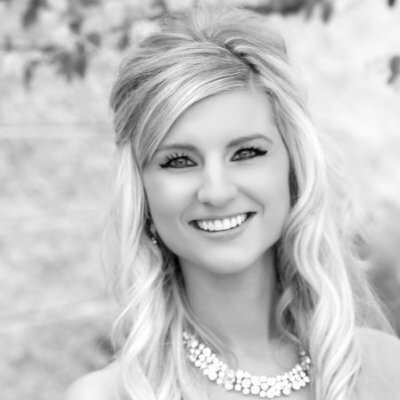 Read more about her story and see her upcoming events. Now… on to the food at Devon Seafood + Steak! Here is the bar menu that we selected from for the evening. My husband chose a Moscow Mule and the Lemongrass Shrimp Tacos, I chose a Moscato and the Prime Black Agnus Mini Burger Sliders. While it took some time to actually get our appetizers (which was expected since there was only one waitress serving the entire room) it was really worth the wait. Overall, we had a really great experience! 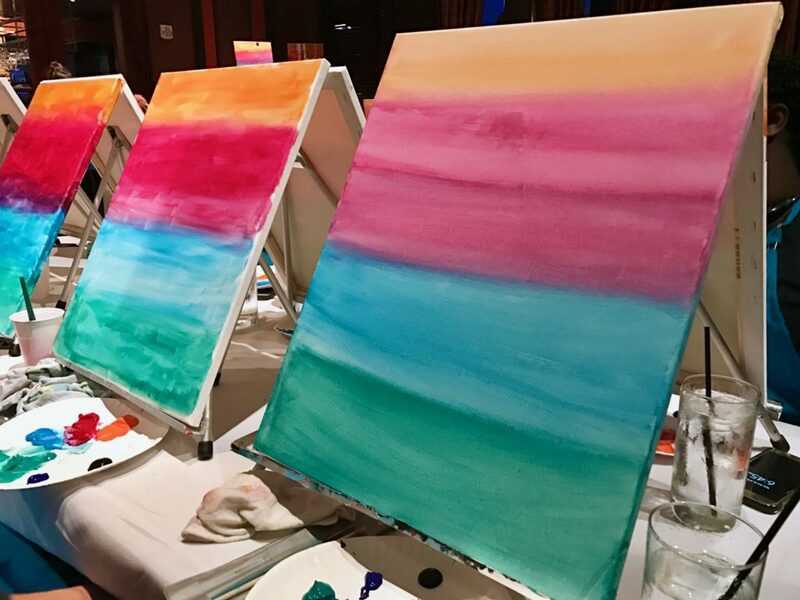 We can’t say we were even close to the best painters in class but we had such a great time at Sip & Paint at Devon Seafood + Steak and look forward to participating again! 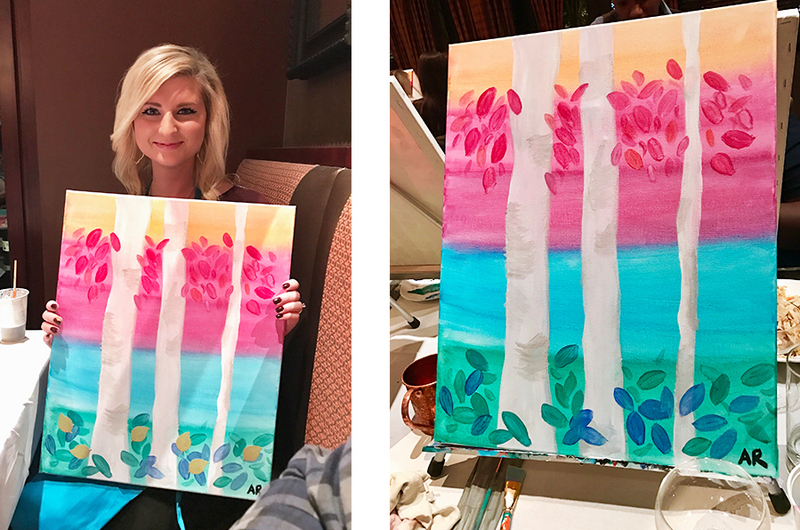 Have you ever been to a Sip & Paint event? Wait, you’re that close to Bayshore?! I don’t think I knew this! I’m in Milwaukee! I haven’t been to Devon, but this looks like an awesome event. 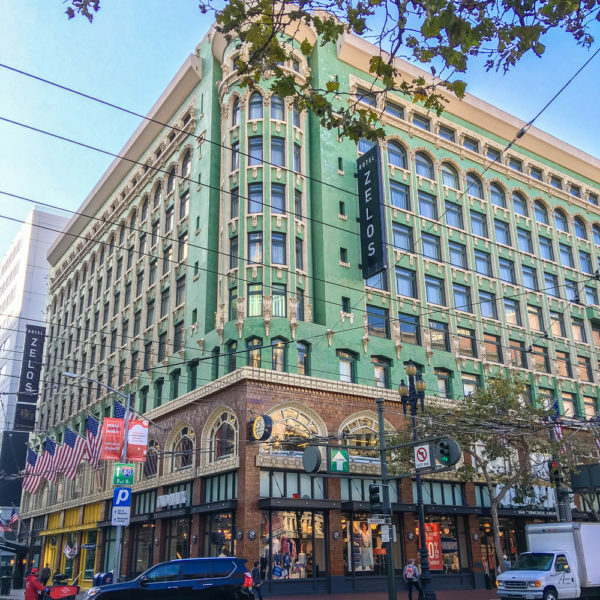 Can’t wait to hit this spot soon! Yes! And that’s with heavy traffic. I actually work near the Third Ward! I’m surprised we haven’t bumped into each other!